bcalm is an inhaler-type device for panic disorder sufferers. Developed by a team of board-certified physicians and panic disorder specialist, the device solves a serious problem. But people simply aren’t aware that panic disorder can be managed with a device. Medical consensus drives people to medication, lifestyle changes and trigger avoidance to deal with panic. Our job was to build awareness, unlock demand and drive action. Regulated industries like health pose unique content marketing challenges. There are just some things you can’t say. As an American-made product, we also had to factor in low brand recognition to the campaign. The UK hadn’t yet heard of bcalm. So we made this campaign about the users, not the product. We developed three stories, ‘The UK Panic Map’, ‘The Most Panicked about Celebrities’ and ‘Post-Brexit Anxiety’. Each gave a unique perspective to the issue of panic disorder in the UK, from where they happen, what triggers them and how social affairs can influence panic disorder. These stories were designed to advocate for sufferers, which we believe fostered sharing and engagement. 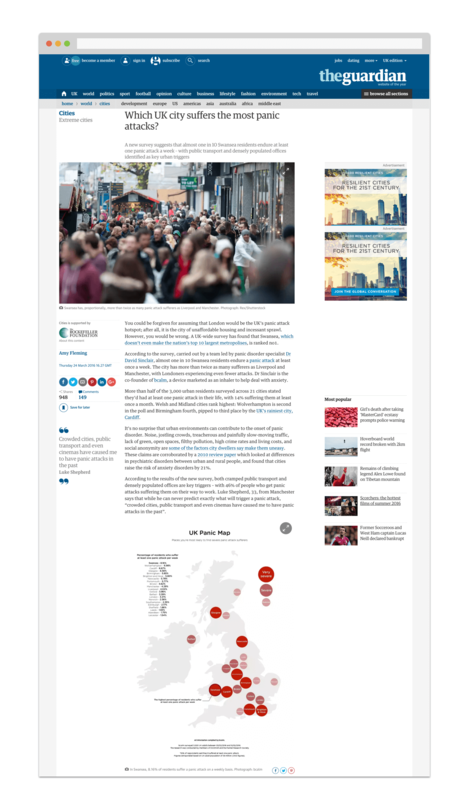 Based on national polling and smart use of the demographic data, we identified the UK’s panic attack hotspots. We then dove deeper, interrogating the data to reveal social trends to reveal hidden panic triggers, such as public transport and bad office layout. Coverage was international. Major UK outlets featured our findings, with most incorporating the graphics we supplied. With links from The Guardian, The Sun, Huffington Post, Marie Claire, Daily Record, Dazed, Yahoo.com, Mental Health Today and more had a huge impact on bcalm’s search engine rankings and brand search volume. The bcalm.co site now ranks in position 1 for ‘panic attack inhaler’. Insights and news to your inbox every Friday. It's never more than 250 words long.